Like Trump, Campaigning Israeli Leader Netanyahu Takes Tough Social Media Tack The Israeli leader and his Likud party are waging a mudslinging campaign on social media, taking a page from the prime minister's close ally President Trump in style and substance. How Israeli attitudes have shifted further to the right under Prime Minister Benjamin Netanyahu. 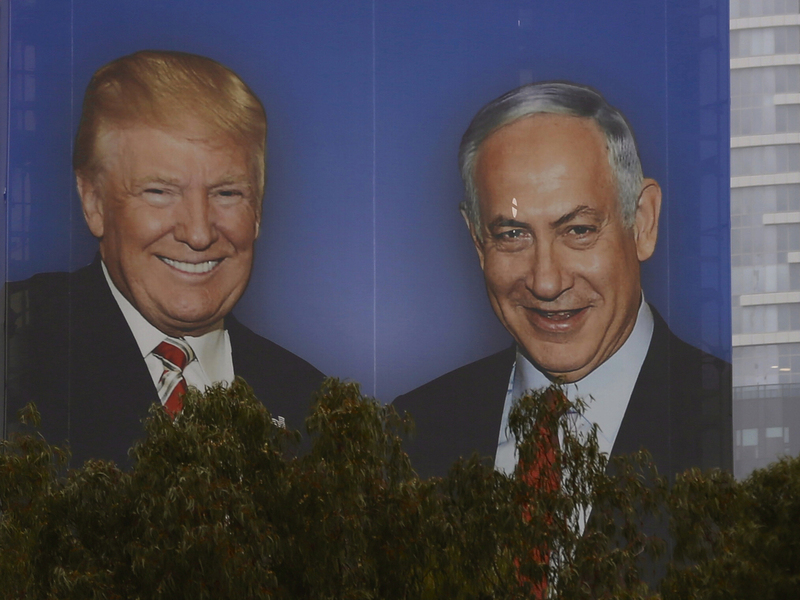 An election campaign billboard in Tel Aviv shows Israeli Prime Minister Benjamin Netanyahu with his close ally President Trump. Seeking re-election under a cloud of criminal investigations, analysts say Netanyahu has been channeling a Trump-style approach, with an angry campaign against perceived domestic enemies. Israeli Prime Minister Benjamin Netanyahu is waging a mudslinging re-election campaign on social media, channeling his close ally President Trump in style and substance. Netanyahu is known not to use a cellphone personally, so there is no Trump-style improvisational tweeting. But as Israel's April 9 elections approach, and Netanyahu faces a formidable challenger and possible indictment on corruption charges, his young campaign advisers are churning out a steady supply of memes and video clips on Instagram, Facebook, Twitter and YouTube to boost his profile — and trash his opponent — to his millions of followers. One theme is constant: Netanyahu's claim that Israel's left-wing media is out to topple him. On Monday, Netanyahu disseminated a video attacking the Israeli newspaper Yediot Ahronot after it, and The New York Times, reported that an Israeli watchdog group discovered what it called a "manipulative" network of hundreds of fake and suspicious Twitter and Facebook accounts promoting Netanyahu's Likud party campaign. "Did you read in Yediot Ahronot? They're calling you Likud voters 'bots,' " a narrator says in the video. Like Trump, Netanyahu uses the terms "fake news" and "witch hunt" frequently. Like Trump's son Donald Jr., Netanyahu's son Yair has become active on Twitter this election season, attacking journalists, celebrities and even Israel's president when they criticize his father's policies. There is also an Israeli version of the Real News Update online newscast supporting Trump's 2020 presidential campaign. Netanyahu's party launched Likud TV, a nightly Facebook webcast hosted by a reality TV celebrity and broadcast from a news-style studio built at the party's headquarters in Tel Aviv. It features the prime minister as a frequent guest — circumventing the mainstream media while also bashing it. "I don't think Netanyahu is imitating Trump. I think Netanyahu was on this path already two decades ago," said Dahlia Scheindlin, a left-leaning pollster and political strategist based in Tel Aviv. "Claiming it's the fault of the news, rather than addressing accusations against him, whether in the 1990s or now, has been the modus operandi for him." Netanyahu served as prime minister in the late 1990s, before returning to office in 2009 and staying in power for the last decade. Now, with former army chief of staff Benny Gantz running against him, he is fighting one of his toughest re-election campaigns yet. Like Trump's 2016 race, Netanyahu's scorched-earth electioneering has taken aim at President Barack Obama, mocked a reporter's appearance and celebrated a hacking scandal involving his opponent. One of Netanyahu's latest Instagram posts features a scene from a PBS documentary in which Netanyahu was described as brazenly "lecturing" Obama about the Palestinians in a 2011 Oval Office meeting. Netanyahu's Facebook account ran a mock interview with an actor accused of making fun of the appearance of Israeli political commentator Amnon Abramovitch, whose face bears burn scars from when his tank was hit as an Israeli soldier fighting in the 1973 Yom Kippur War. Following an outcry, Netanyahu's staff removed the video from his Facebook account. That was only days after Netanyahu's party came under fire for a Facebook video clip depicting a military graveyard and warning that his opponent, Gantz, would cause "hundreds of deaths" and that "the left is dangerous." His party apologized and took down the video. The Israeli election cycle even has its own version of the Russian hacking scandal. Netanyahu has ridiculed Gantz, who acknowledged that Iran hacked his private cellphone several months ago. One campaign meme goes: "Netanyahu hacked the Iranians and took their information," referring to a recent Mossad spy operation to steal Iran's secret nuclear archive. "The Iranians hacked Gantz and took all of his information," the meme concludes. Sometimes it is Trump who provides Netanyahu's campaign material. After Netanyahu visited Trump in the White House last week, Netanyahu's campaign borrowed a video montage that appeared on Trump's Twitter feed, added Netanyahu's Hebrew narration, and replaced the White House icon at the end with Netanyahu's campaign logo. Netanyahu has also plastered the sides of buildings with large campaign posters depicting him and Trump standing together, shaking hands and smiling. The original photo was taken during Trump's own election campaign. A Likud spokesman declined NPR's request for comment on Netanyahu's social media ads. Gantz's party has returned attacks on Netanyahu on social media, implying Netanyahu was behind the newly reported network of fake social media accounts and "cheating" the voting public. The Israeli watchdog group said it found no direct links between the accounts and the prime minister. Concerning corruption allegations that Netanyahu had a personal financial interest in approving Germany's submarine sale to Egypt, Gantz tweeted that "according to the defense establishment - Netanyahu harmed state security and the Israel Defense Forces' qualitative advantage." The Israeli Defense Ministry announced no such conclusion, and Netanyahu denies wrongdoing. ... to the finance minister's Hebrew-English mock movie preview featuring a flatulent hippo.